It's hard for me to believe that the November issue is already out. I'm barely thinking about Halloween. And Thanksgiving is "months away." Of course, all the major department stores and the mall already have their Christmas decorations up, but I'm choosing to ignore that, at least for a little while longer. It seems like we only have two holiday seasons these days: Christmas and Un-Christmas — the Un being the shorter of the two. If you're one of those people who like to count down to significant events, and you happen to receive this magazine right on November 1st, you have exactly 55 shopping days left. Well, 55 if you celebrate Christmas. Actual shopping days may vary depending on your celebratory habits. No matter which countdown calendar you're on, I hope that it's filling up with magic shows. After all, 'tis the season! And the Un will be upon us before you know it, so enjoy! Months before I found myself sitting in the balcony of the Blackpool Opera House, watching the FISM finalists compete for the Grand Prix, Charlie Frye had tipped me off that 2012 was going to be Korea's year. And he wasn't talking about the country being awarded the bid to host the World Championships in 2015, which ultimately went to Italy. 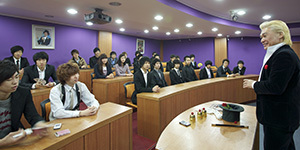 Nope, Charlie was talking about the crop of outstanding magicians developing in Korea. And was he ever right! A few hours later, when the awards had all been handed out, Korea had chalked up 8 of the 32 trophies presented — exactly 25 percent — prompting many of us to ask, "What's going on in Korea?" 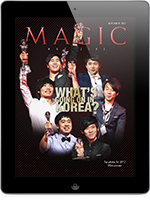 This month, Gregory Bracco, who has been living and working in South Korea for the past decade, answers that question and introduces us to a new, exciting community of magic. 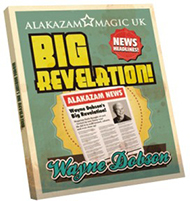 It's all in the November 2012 issue of MAGIC Magazine, available both in print and on the iPad. If you haven't already received your copy, here's an advance look at what else is "between the covers." 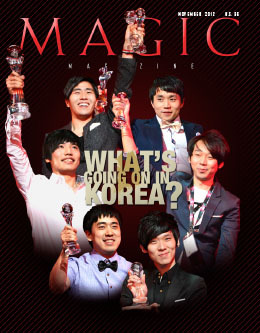 Korean magicians swept the Manipulation category at FISM this year, and in recent years have been earning more and more accolades around the world. What is going on in Korea? Just the creation of an inventive, sharing community that encourages and nurtures conjuring talent. 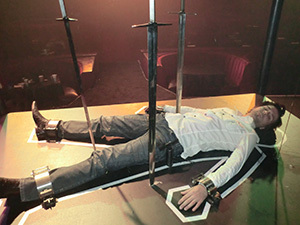 Jan Rouven is known as "The Man With Nine Lives" because his act features death-defying illusions, and his onstage persona is that of a man who enjoys taking dangerous risks. Interestingly, this is also an apt description of the career path of Las Vegas' newest magic headliner. Bruce Bernstein has spent over three decades creating, refining, and developing dozens of devious feats of mindreading and mentalism with cards, prediction tricks, cold reading, and techniques that have become standard operating procedure for thought-stealers of every stripe. 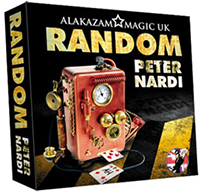 He has been a trusted, go-to consultant for many of the world's top psychic entertainers, enjoying an enviable reputation in the field. If there is one hallmark of Bernstein's work, it is simplicity of method. All of his routines are within the grasp of the thoughtful performer. The two tricks and technique presented here give a flavor of how he constructs effects and how his mind works. It's a classic magic plot. A living, healthy being is apparently dispensed with -- cut in half, dismembered, cremated, vanished in a cloud of smoke -- but then rises to live again, fully functioning and seemingly no worse for the experience. Onstage, it happens regularly to assistants, doves, and other animals. 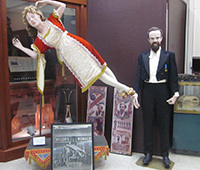 Offstage, it happened to the Society of American Magicians Hall of Fame and Museum. "Electrified: One Million Volts Always On" was the full title of Blaine's latest stunt, which placed the "endurance artist" atop a twenty-foot-high platform erected at the end of Pier 54 in New York City. Blaine remained standing on his perch for 72 hours. But he was not merely remaining awake and waving to the crowds who came to watch -- he was surrounded by an array of seven Tesla coils, subjected constantly to electricity that arced down toward his body. The whole event was streamed live on YouTube as a promotion for Intel Corp.
Robert-Houdin's Light & Heavy Chest. The miraculous chess-playing Turk. The infamous Bullet Catch. The legendary Indian Rope Trick. These fabled magical effects and more are explored by Steve Cohen in a new two-hour television special, Lost Magic Decoded, which premiered Thursday, October 18, on the History Channel. David Copperfield analyzing trick football plays on NFL Top 10, Michael Grandinetti performing at halftime at a Carolina Panthers' game, the buzz on the Genii Bash, as well as the latest on IMX, Magic-Con, Columbus Magi-Fest, and a lot more. This month, we feature an in-depth examination of the repertoire of California's Joshua Logan. Logan is a professional magician in Santa Cruz, and he joins us to share several interesting moves and sequences, along with what is sure to cause a stir: his controversial Freak Out effect, which has a method befitting its title. You borrow a $1 bill, fold it in half, and clearly tear Washington from the center. With a snap of the bill, this gaping hole is fully restored, and the bill is returned to the suitably stunned spectator. Lighting is key in creating mood, tone, sculpting, and landscapes. Lighting transforms an ordinary scene into an extraordinary composition. The lighting should enhance the overall dramatic presentation of your act or show. Everyone has played the game of Rock, Paper, Scissors at one time or another. It's a simple game and everyone knows that it's fair. This month's routine is a bare-faced swindle based on this game. First, a spectator makes three random choices and achieves an extraordinary result without knowing how. You then show that you predicted his three choices exactly, via a printed prediction that was in play from the start! Viewpoint: MAGIC, Tiger Beat for Finger Flickers? In the August issue of MAGIC Magazine, one stalwart reader questioned why so many photos of Neil Patrick Harris accompanied the cover story, and he asked whether MAGIC was a magazine for magicians or a fan mag. He implied that the editors had stars in their eyes when it comes to Neil Patrick Harris and that starlight had blinded them to their duty. An argument can be made that Neil Patrick Harris is the most important person in magic today -- more important than Criss Angel, or Penn & Teller, or Copperfield. Money. Most magicians don't have much. That's where you come in. With disproportional power comes disproportional responsibility. You can alter magic history. You can be a legend. And I'm sure we can work out some tax breaks, as well. I recently surveyed some of the most respected minds in magic (I was saving you until now) and unanimously determined that the current state of the art of magic (The Age of the Stooge?) can be thoroughly renovated! There can be a magical renaissance! The "made for TV" doldrums can end; a rush of wonderful ideas and live shows can flourish! It's just going to take a little cash. Some lucre. Moolah. Scratch. Spondulicks. How much for a renaissance? According to our calculations, 4.3 million dollars would be sufficient for a Magic Stimulus Package. Many magicians appear to be unaware of the valuable tool set one can acquire by participating in a theatrical production. Understanding how to move onstage or how to effectively use one's voice is just as important to the performance of magic as knowing how to control a card or palm a coin. I often hear "I don't want to sound mechanical or stilted" used as an excuse for not scripting performances. Delivering scripted dialogue in a natural and extemporaneous-sounding manner is one of the first skills that theatrical artists learn. Here's a way to burn your web address into your audiences' retinas and brains at the best possible time -- while they're having a blast during your show. That's right, build an infomercial right into the middle of your show, and entertain your audience while you do it! You can now choose to receive MAGIC risk-free with our new "Monthly Subscription" for only $5 each month. Of course, you can still subscribe for the entire year, as well.